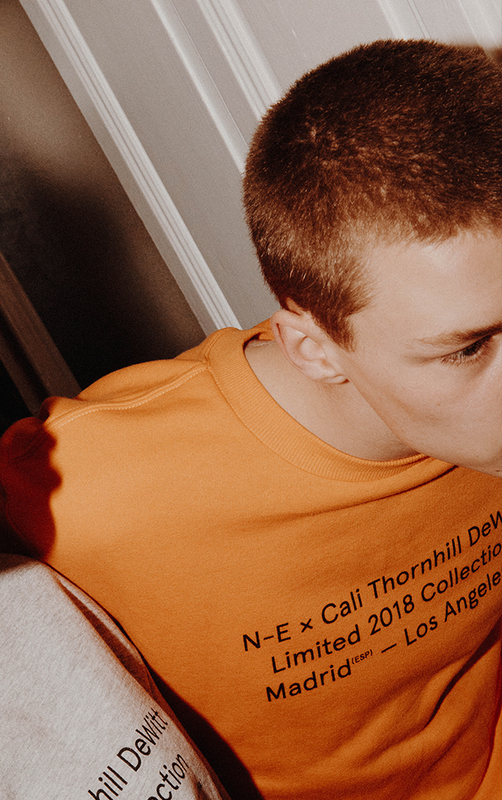 N-E × Cali Thornhill DeWitt is a streetwear collection designed by the L.A. based artist Cali Thornhill DeWitt, the designer behind Kanye’s The Life of Pablo merch, and the Madrid based design studio Naranjo-Etxeberria. The collection counts with two t-shirts and two sweatshirts created with original artworks from DeWitt’s fanzine archive. It is a limited and numbered collection of 100 pieces: 25 per model. The campaign shooted by Enric Roig which had as the main scene Naranjo-Etxeberria offices was based on the idea of showing streetstyle but not for women or men, a unisex collection that doesn’t differ between any gender. For the launch of the collection N-E came up a Pop-up store during Madrid’s Art Fair people could find the whole collection and an installation with different artowrks all around the gallery.